At the back of our tongues, there live old dwarfs, who could only go out and play (and be happy) when we say please or thank you. In a small house at a small town, two children are eating dinner with their family. "Mom, could you pass me the salt, please?" said the first child. "Thanks mom," said the first child again with smile. The old dwarf at his mouth was very happy, he went out, breathe fresh air, and jump around for a bit before going back to his house. Not long after, the second child also need salt. "Mom, pass me the salt," said the second child. Without please or thank you, the old dwarf living in the second child's tongue couldn't go anywhere. It had been going on for quite some time. The old dwarf is getting weaker and weaker each day. The old dwarf living in the first child felt pity towards the second one. So one day, when the first child says please, he decided to visit his friend. "You look ill, my friend," said the first dwarf. "Well, I haven't been out for quite some time." "This child will never say please or thank you. Let's live at my house and leave this child. You will be much happier there." The first dwarf then help the second one to move to his house. Since the first child has two dwarfs, he keeps saying please and thank you twice in each sentence. Both dwarfs were happily playing and jumping around here and there. "Mom, could you please pass the salt, please," said the first child. "Thank you, mom, thank you." "You don't need to say please or thank you twice. One is enough," said the mother while smiling. She was so proud that her child is very polite. Looking at how happy his mother was and the attention that his mother gave to the first child, the second child was jealous. He also wanted to say please and thank you. "Mom, could you pass the salt, p... Pl... Pl...," he wanted to say please, but he can't. He no longer had his dwarf. "You should start saying please and thank you like your brother," said his mother. The second child was sad. He had learnt his lesson and really willing to say please and thank you. The old dwarf realized that the second child has changed. So he said good bye and thank you to the other one. And back he is to his house in the second child's mouth. Finally, the two boys in the house live politely with their please and thank you and the dwarfs live happily ever after. I don't remember the detail of the story, but more or less, that was the story that I read in Bobo when I was in elementary school. Even then I knew that it was just a story. There is no dwarf living in my mouth. But the story has left its mark in my mind. I started giving more attention to things that I say. I put please and thank you here and there and felt happier. 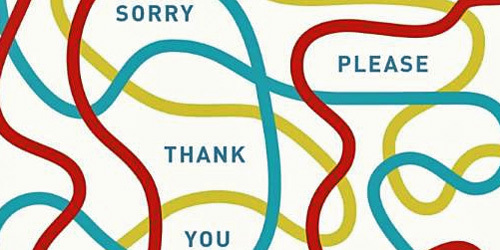 Saying please and thank you to other people also make them feel appreciated. Even if it's their duty or their job to do something, there is no harm in saying please and thank you. "Can you please buy me ketoprak when you go out?" "Thank you for the meal, mom." "Can you please send me the file right now?" "Thank you for the heads-up." So, let's say more please and thank you and spread the habit!